Perform regular water changes to keep alkalinity (acid-neutralizing capacity) and pH stable. 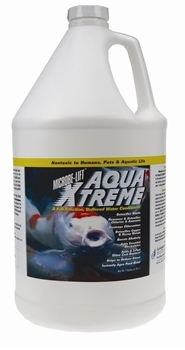 Use MICROBE-LIFT/Aqua XTreme as needed to eliminate and control ammonia at the regular dosage rate for each 1mg/L, or fraction thereof, of measured total ammonia for each 0.85 mg/L of measured total ammonia-nitrogen. Use a salicylate (indolphenol) type total ammonia test kit. Please Note: Do not use with a permanganate-based or chlorite-based treatment. Nessler's total ammonia test kits will give a false high or off scale reading. Winkler's dissolved oxygen test will give a false low or zero reading. Microbe-Lift/Aqua Xtreme label states "Please Note- Do not use with a permanganate-based or chlorite-based treatment..." This is due to the permanganate- or chlorite-based chemicals having the capacity to break down part of the polymerization process necessary to remove chlorine-ammonia-nitrite and heavy metals from your pond water. A proprietary formula in an aqueous solution. 16 oz. (XTP16) Treats up to 960 gals. 32 oz. (XTP32) Treats up to 1,920 gals. 1 gallon (XTPG1) Treats up to 7,680 gals. Avoid contact with eyes. If contact occurs, flush eyes thoroughly with cold water.